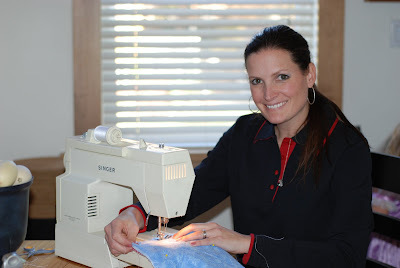 Singing and Spinning: Who is that at a sewing machine? 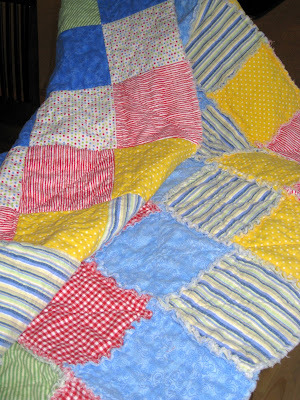 When Ivy was born, a friend of mine in Michigan, Ami, gave me an adorable rag quilt. 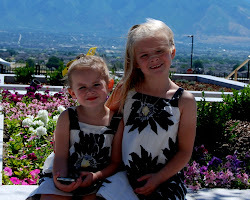 I used to bundle Ivy up in it for church. It's amazing how many compliments I got on that quilt. I absolutely love it and use it to keep myself warm. It is the perfect baby size, but not a great big kid or grown-up size. Kat is having a baby in December and I decided I should give quilting a try. Not real quilting, but rag quilting. My mom and I set out to find some fun flannels that would work with Kat's color choices. The nursery is blue, yellow, red and green. (She made a beautiful crib quilt). We found a lot of really fun flannels and figured out the pattern. I decided to make it 8 squares across and 8 squares down. (The one Ami gave me was 6 x 6- perfect baby size). I have not sat down at a sewing machine since sewing class in 8th grade (okay, I lied, I helped sew the kids Halloween Monsters). All I remember sewing then, was a pair of pink flowered shorts. They were cute, but by no means well made. I'm not a natural, so it isn't something that I've dedicated much time to. After making Kat's quilt, I just may rethink that. I actually really enjoyed doing it. It was somewhat therapeutic. The old sewing machine (it's my grandma's and she's been gone for 8 years) was a little noisy. I'm going to have to research a bunch of sewing machines to see if I can find one that is a little quieter so that I can sew while Scott and I watch TV. Here is the final product. It's a great size, and Kat was able to cuddle up in it. A perfect size to grow into! Jade is asking for one in pink, purple, blue and green. We'll have to see what I can find. Mom started to look for some flannels for me, but they are all pastels. I'm not sure if that is the direction for Jade's- but maybe for Ivy. I have a very similar picture of me at a sewing machine from 3 years ago. 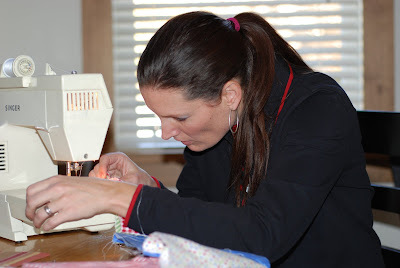 I was in Ami's kitchen and she was teaching me to sew. I was hooked after she taught me how to sew her rag quilts. Did you see my post on her blankets? You did a fantastic job. I don't know where you find the time! Hi. first of all let me say that i like your blog. Thanks for sharing.